In the just released fourth Chaos Codex Chosen have been split into two different army list entries, actual Chosen which can infiltrate and be armed all sorts of crazy ways which I like, and terminators which can be cheap and come in squads of three. I like both options and will likely use both at some point in the distant future, but I also think they will be unmarked troops to keep them cheaper, so my large squad of now very well painted Nurgle terminators will just collect dust. I tried to make Plague Marine terminators work using the third Chaos codex in my third tournament army, but they were just too expensive. I think in truely large games where you can afford to buy say ten of them it might be a valid choice in the 4th Chaos Codex but I think a small cheap squad that can be surgically inserted to take an objective or lend crucial support is the wave of the future. I'm well aware Dreads are now Elite, they have their own page, which they share with the other walkers in my Nurgle army. Anything that is supposedly good in game terms is often described in the White Dwarf as Right Hard. Terminators if you believe the fluff are the be all end all of man sized troops. However depending on what the rules and points costs are at a given point of time I've found them to be unable to kill enough to pay for themselves. This proved true at the Vancouver 2003 GT. I had a very expensive retinue of Chosen, half of which were terminators. During the glory days of twin reaper autocannons they could deal out some death. I believed they would be more effective without power and chain fists, cause they'ed be cheaper. I've painted up one or two of the new ones and I eventually stripped and repainted my old terminators often arming them slightly differently by purchasing or converting additional arms. That process is now complete and any future terminators I paint will not be Nurgle aligned in all liklihood. Ouzo the Unsettling or Ostiperosis the Old School can join this squad giving me 10 in a squad and under the 4th Chaos Codex rules I can field a squad with two reapers. I think three squads of three especially if the have no icon is a cheaper way of getting multiple reaper autocannons on the table top. However with Heavy Flamers being so cheap, I plan to finally try those out and just rely on massed combi-mealta fire to kill tanks in any future terminator squads I paint up. Killing lightly armed troops has never really been a problem for my Nurgle army, which is why it does well against many horde armies. 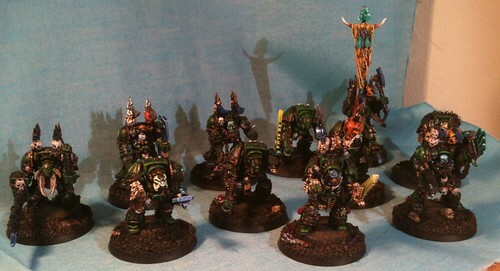 These are some terminators both from the then current line and some OOP ones which I stripped then repainted. They are painted in the tiny line style for the most part. However they were painted in three batchs using slightly different shades of green. That said they look pretty good all aligned together though the photo is too dark. I even rebased them when GW changed the rules yet again.